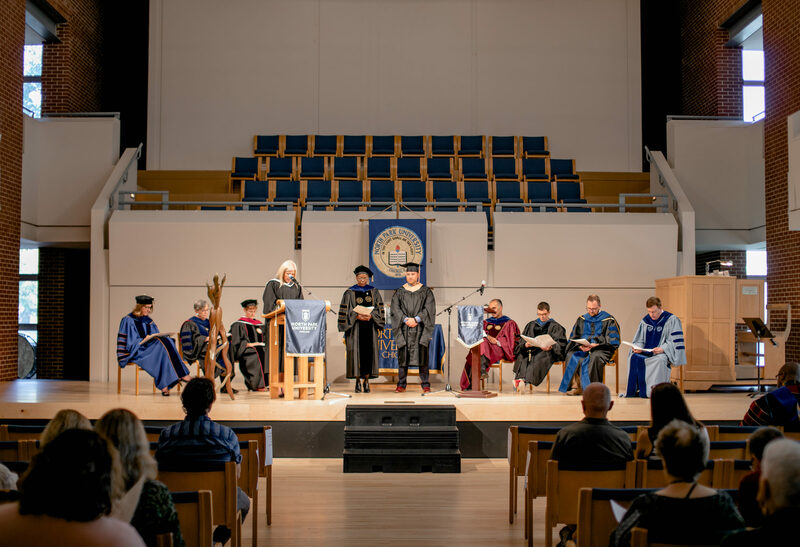 North Park honored its faculty at the annual University Convocation September 17, installing new and tenured faculty and administrators, and recognizing those who have published books and articles in the last year. In her address to the nine professors who attained promotions or tenure at the ceremony in Anderson Chapel, President Mary Surridge commended them on their hard work and devotion to North Park. Provost Michael O. Emerson recognized the 10 faculty members who have recently published books, which ranged in topic from mathematics to Hip Hop music and its application to theology. Ingrid Tenglin, assistant vice president of human resources, installed two new administrators: Lisa Ncube, associate provost for enrollment management; and Anthony Scola, vice president for enrollment management and marketing. The faculty members were honored at a reception after the service.